This timely book offers a practical and workable approach to building an affordable, sustainable, environmentally-sensitive house by having owners build it themselves. Richard Burnham draws on the practices of native people, pioneers and third-world populations to create a concept called minimumexistenz, which is both affordable and sustainable. Minimumexistenz — while not for everyone — offers an important counterpoint to ever-growing suburban monuments. 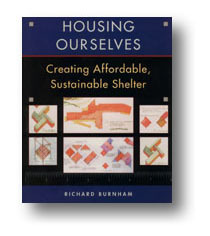 Burnham explains how to: Choose materials that are cost-effective, sustainable and originate locally. Design homes that are suitable to an area’s climate, topography and other shelter requirements. Launch the project on a shoestring and add on incrementally as finances permit. Create homes that bring individuality and variety back to today’s homogenized landscape… And much more! Although this book is clearly targeted for owner-builders, professionals committed to affordability will find useful ideas, too.